When it comes to holidays, I’ve always appreciated that Thanksgiving is on a Thursday. We usually get a four day weekend where we can just lounge around. As a result, it’s my favorite part of the holiday. Usually, we have a leisurely breakfast on Friday morning before heading out to cut down our Christmas tree. In fact, it was a tradition throughout my childhood and we’re now continuing with my child. 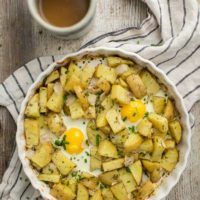 This potato egg bake is the perfect day-after Thanksgiving breakfast. It’s hearty but not heavy and the cooking is fairly hands-off. 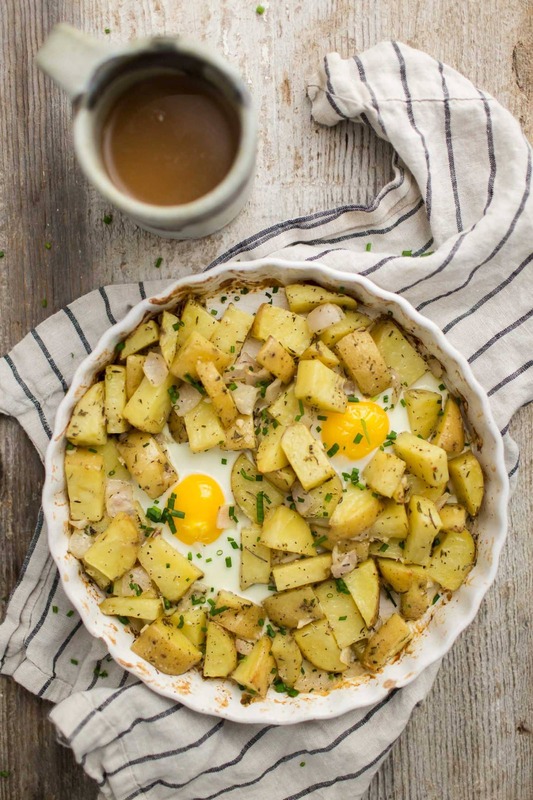 Plus, with some Frontier Co-op dried herbs, you can use up any leftover items like potatoes and cream. This recipe also works with other types of potatoes like fingerling or sweet potatoes! An easy, after-holiday breakfast that can help use up leftover potatoes and heavy cream. Can be made into as many servings as needed! Cut potatoes into 1/2 inch pieces. Dice shallot and mince garlic. Place potatoes, shallots and garlic in a large baking dish. Pour in heavy cream, rosemary, thyme, salt, and pepper. Toss everything together so potatoes are coated evenly. Bake for 10 minutes, stir, and bake for another 10 to 15 minutes, until potatoes are tender. Remove from oven. Using a spoon, create two wells in the center. Crack eggs in the middle and return to oven. Continue to bake until eggs have set, 7 to 12 minutes depending on desired firmness of yolk. Remove from oven and serve with a sprinkle of chives on top. Tips & Tricks: A slightly smaller dice of the potatoes will help them cook more quickly. While I typically roast potatoes with olive oil, I love the cream in this recipe. It adds an extra touch of richness to the dish. Also, I always have dried herbs on hand, making this an easy dish to make in a pinch. POTATOES: Swap the yukon gold potatoes with red potatoes, fingerlings, or even sweet potatoes. BRUSSELS SPROUTS: These eggs would also be excellent with rosemary roasted Brussels sprouts instead of potatoes or even in addition to the potatoes. CHEESE: Add a sprinkle of cheese when you crack in the eggs. Parmesan, mozzarella, or even Swiss would be excellent with these baked eggs. The holidays always help me to center around food and family. It’s the ultimate reminder about food connecting us with people we care about. 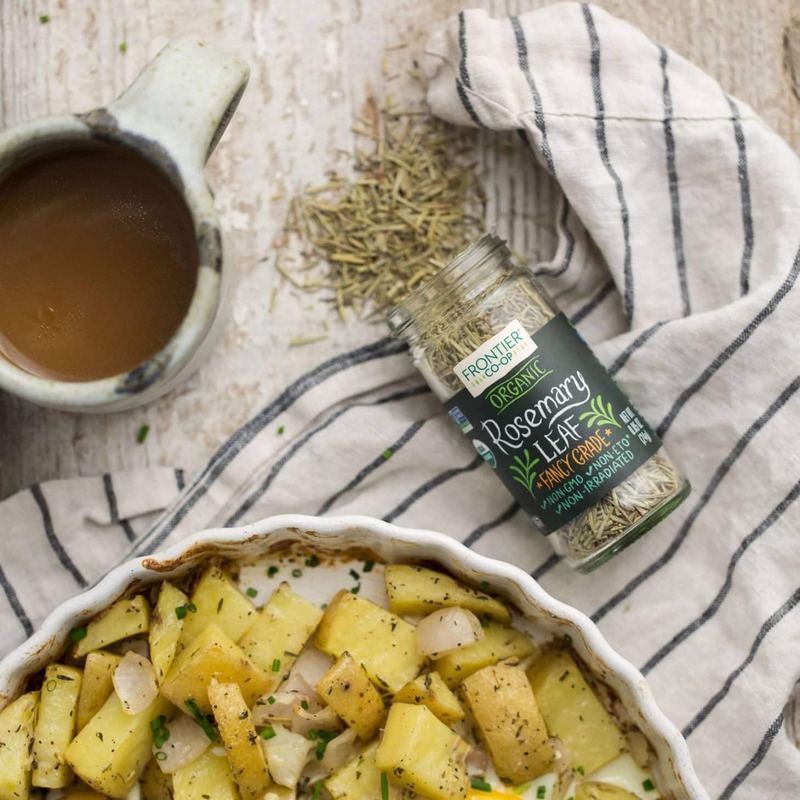 Frontier Co-op’s herbs are also a big part of my family meals and when they asked me to share about how I cook with purpose, a family breakfast embodies that for me. i didnt grow up celebrating thanksgiving but now its my fav holiday too! this is a perfect brunch idea. I like the suggestion of adding Brussels sprouts to the mix. That just makes this already delicious recipe that much better. This recipe is gorgeous! 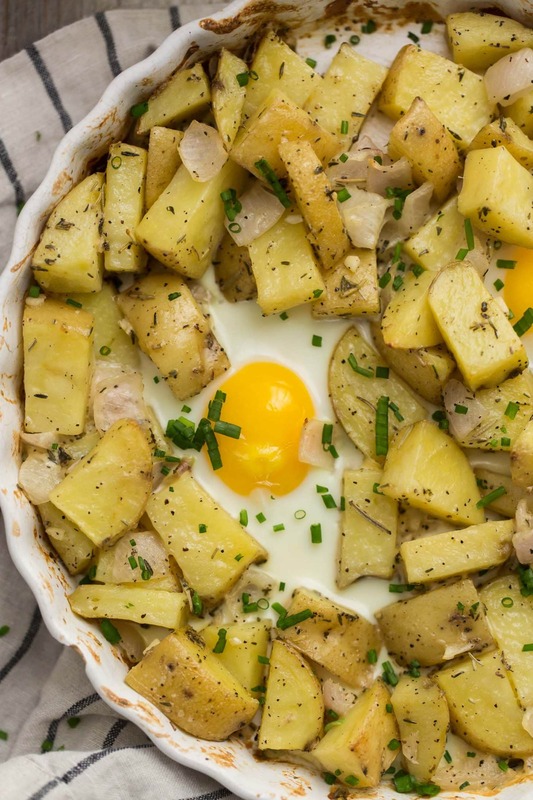 Potatoes and eggs are such a classic combination, and the herbs add a nice layer of flavor. Perfection! This was delicious!! I found my potatoes did not cook through in the times listed here though, even though they were chopped small. Strange- how long did it take them? Did you us Yukon gold potatoes? Thanks! This recipe is gorgeous and easy to make!